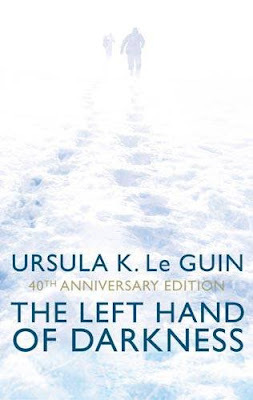 Dark Wolf's Fantasy Reviews: 40th anniversary of "The Left Hand of Darkness"
Ursula K. Le Guin’s “The Left Hand of Darkness” is one of my all time favorite books. Since I first read it I returned a couple of times with great pleasure to the planet Winter in re-readings of the novel. This year seems like a very proper time for a re-visit to Winter, because “The Left Hand of Darkness” celebrates its 40th anniversary. I own the Romanian edition of Ursula K. Le Guin’s novel, but I am very much tempted to buy the anniversary copy which will be released by Orbit Books UK this November (especially since I find the cover to be very appropriate for the content within). Genly Ai is a diplomat of sorts, sent to observe the inhabitants of the snowbound planet of Winter. But the isolated, androgynous people are suspicious of this strange, single-gendered visitor. Tucked away in a remote corner of the universe, they have no knowledge of space travel or of life beyond their own world. So, bringing news of a vast coalition of planets they are invited to join, he is met with fear, mistrust and disbelief. But also something more. For Genly Ai, who sees himself as a bringer of the truth, it is a bittersweet irony that he will discover truths about himself and, in the snow-shrouded strangeness of Winter, find both love and tragedy . . .
Again I'm clueless. It seems I didn't read much in my life. I must admit I know the name of the author but didn't read a single book by Ursula K. Le Guin. It sounds intersting enough to add it to my "small" list. I've not read any Le Guin either although I always think she seems fabulous in interviews and things. I need to reread this one of these days. I read it so long ago I don't even really remember it.